Hey, Marty, get the DeLorean ready! I think synthpop is slowly rewedging its way back into the music scene! Popularized by the major players (Lady Gaga, as a primary example), we tend to forget the pioneers of the 1980s that made this type of music so accessible and accepted. Remember when Duran Duran was huge? Depeche Mode? Flock of Seagulls (anything beyond "I Ran", perhaps)? New Order? Yes, many of the classic synth bands of olde are still around now, but they don't have the same pull as they did back in the apex of the early-to-mid 1980s. So where did their sound go? I'm hoping that it didn't dissolve entirely, only to be replaced with the more disturbing and perhaps overly sexualized tone of Lady Gaga's "Bad Romance". Well, I can assure you that it hasn't completely fallen off the aural map. 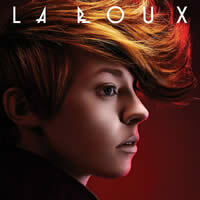 The duo of Eleanor "Elly" Jackson and the generally unseen Ben Langmaid, known collectively as La Roux based off the lead singer's distinct hair hue, certainly have kept it alive with their debut self-titled album. It screams the 80s, while maintaining the kitschy sound of a modern indie group. But are their efforts for naught? In other words, even with that classic sound, is the album itself worth the disc it's embossed upon? I'll answer it plain and simple: yes. Ever since I tuned in to the very first track, In For The Kill, I knew that there was something special here, and not simply because I heard it in a commercial for the video game, Bayonetta. Held together by Elly Jackson's forceful and sometimes surprisingly high-pitched falsetto-esque voice, the desire is there to hear just what she has to say. In fact, maybe it's Elly's vocals alone that make the compilation of tunes so alluring. Never mind the fact that she passes herself off as an androgynous flame-haired sprite and that she styles that hair largely pointed upward in an over-embellished Ace Ventura 'do. I think that's just enigmatic fluff meant to lure listeners and/or viewers, but the fact remains that she has a strong yet almost cute voice that drives every song. The song is also quite catchy; it was sticking in my head incessantly at work for a while, causing me to be intermittently mufflebrained and mentally abandoned. That's the sign of a hip track to me. Further listening also reinforces their abilities. Tigerlily, for example, is a ballsy number that shows off Elly's angrier voice while maintaining a funky disposition. Quicksand couldn't possibly sound more like something torn from the New Wave catalogue and given a slightly modern update (though not by much), while Bulletproof reminds me of those 80s pop princesses like Debbie Gibson and the mall sensation, Tiffany. Another highlight of the album is I'm Not Your Toy, which, although very simple, is charming in its own little cheesy way. Maybe I should listen to that song while riding an elevator, just to see if the two match up well. They just might. And Reflections Are Protection... if that doesn't sound retro, I'm not sure what does anymore. Instrumental parts of La Roux's music are typically kept a bit downtempo and in the background to highlight Elly... at least that's what I believe is happening. Could be laziness. I can't tell. As a sidenote, it was very noticeable to me that Elly splits the paradigm that the British suddenly adopt an American accent when they sing. I always wondered why that was, especially with the Spice Girls back in 1996, but now I know that I just had bad examples to follow.